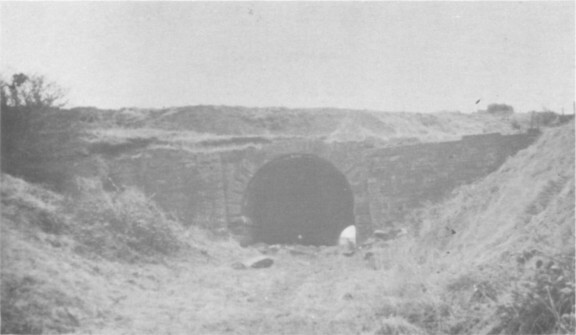 Lintz Colliery (about 4 miles north-east of Consett in County Durham) was won in 1855 by two gentlemen named McLean and Prior, of whom very little is known. It was a fairly small pit, with an annual average output, at least in the seventies, of about 90,000 tons of coal, 40,000 tons of coke and 18,000 tons of clay, for coke ovens and brick kilns were also built at the pit. In order to ship the coal on the Tyne a waggonway about 1½ miles long was built south-eastwards from the pit to White-le-Head on the North Eastern Railway's Tanfield branch, with a stationary engine in the yard at White-le-Head to haul the full waggons up from the colliery. At Pickering Nook this waggonway passed underneath (by means of a short tunnel) the section of the Pontop & Jarrow Railway between Burnopfield and Dipton, which had itself only been constructed the previous year. LINTZ (Black Hawthorn 258 of 1874) – drawing by Doug Clayton. Subsequently a link between the Lintz line and the Pontop & Jarrow was made at Pickering Nook and Lintz traffic began to come down its new route about March 1867. It seems probable that the Pontop & Jarrow locomotives worked right down to Lintz Colliery, though this cannot be proved. In February 1870 the colliery was offered for sale to Palmers' Shipbuilding & Iron Co. Ltd., whom it would have suited very well as its produce could have come down the Pontop & Jarrow into Palmers' works, but the negotiations fell through, and only a month or so later the whole of the Lintz traffic was diverted back on to the North Eastern Railway. How this was achieved is not known, but probably the now derelict waggonway from Pickering Nook to White-le-Head was resuscitated. Subsequently a self-acting incline was built from the colliery to the North Eastern Railway's Blackhill branch, which it joined just north of Lintz Green Station.
" …. the spring pin, instead of resting directly upon the axlebox (of the trailing wheels), is fitted with a heart-shaped cam, this cam in turn bearing upon the axlebox. From the form given to the cam it follows that any lateral movement of the axle – the axle-boxes being made so as to permit lateral play – causes a slight lifting of the load resting on the trailing springs, and thus the tendency of the arrangement is always to keep the axle in the mid position. This ensures steadiness when running on a straight line; but at the same time the controlling power is not so great as to interfere with the free movement of the axle on curves. On the line where the engine is in use the curves vary from 5 chains to 2½ chains radius, and these are traversed with perfect ease." The line itself was quite heavily graded. For nearly half of its two miles the gradients were chiefly 1 in 50, and the remainder was little better, with gradients 1 in 65, 1 in 82 and 1 in 84, with a general rise against the load. The normal load was twenty full wagons each weighing 6 cwts empty and 15 cwts full, making the gross weight of the train 22½ tons. In 1876 a standard gauge 0−4−0 saddle tank (8½in cylinders) arrived at Lintz Colliery, or the Anna Pit, as it was usually known. This was built by John Fowler & Co Ltd, works number 2849, and despatched from Leeds on 15th July 1876. From the middle of the 1870's a severe economic depression set in, and the coal trade was badly affected. From the N.C.B. list of abandoned mines in County Durham it would appear that the West Lintz Drift was laid−in about 1878, though the colliery is said to have survived until 1885, being abandoned two years later. 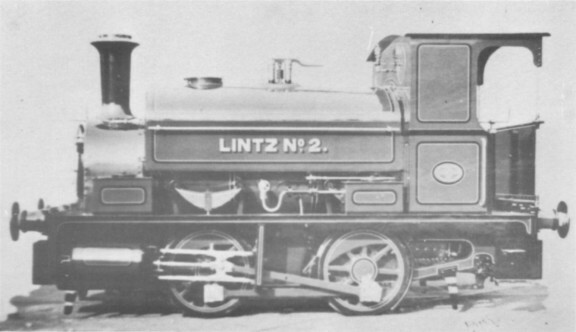 The two locomotives were offered for sale on 8th July 1887, but nothing further is known about either of them; it would seem unlikely in view of the time during which they had been standing – LINTZ for nearly ten years – that they would be fit for little else but scrap. However, the Anna Pit gained a new lease of life when in 1889 it was reopened by a Mr John Shield. At first he seems to have used horses for shunting; but in 1893 the colliery is said to have acquired an old North Eastern Railway 0−4−0 saddle tank, believed to have been one of the "959" class. It was probably named LINTZ.No.1 and is supposed to have ended its days as a stationary haulage engine. At this point information becomes very scarce, but it seems that some time before the turn of the century the colliery was taken over by the South Garesfield Colliery Co. Ltd., who had begun operations at South Garesfield Colliery (formerly named North Lintz) a short distance away, in August 1887. Not long after, this Company opened up the Esther Pit, which was almost certainly the old South Pit, closed 31st December 1874. The old narrow gauge line was relaid as a standard gauge line up to the Esther Pit, the section to the old drift being abandoned. Lintz Colliery finally closed sometime in the mid-1920's, and LINTZ No.2 was sold to the South Derwent Coal Company, only to cross the border into Northumberland in 1937 when it was sold to the Cowpen Coal Company. As COWPEN No.14 it was taken over by the National Coal Board and scrapped at Cowpen Shops in January 1961, only a few months after the old South Garesfield Colliery was itself closed. The trackbeds of nearly all the lines from Lintz Colliery may still be seen, most of them as footpaths. The site of the Anna Pit itself, however, has now largely disappeared under a new housing estate. Acknowledgments are due to D.Clayton, C.G.Down and R.West for the maps and drawings, and to A.Duke for the Fowler information.